Warm colours indicate frequently used routes, cool colours indicate underused cycle routes and white routes were not used by respondents at all. In 1999, as part of its aim of getting more people to cycle to work in central London, Central London Partnership (CLP) undertook a study of modes of travel to work to a number of central London businesses. The purpose of this survey was to establish basic data on cyclists’ journeys to work, identify what the barriers to cycling are for those who don’t currently cycle and help ascertain the most effective improvements to address these barriers. This leaflet provides a summary of the findings. Every weekday, 1.1 million people commute into central London (the area generally corresponding with the Mayor’s proposed congestion charging boundary) in the morning peak period, and about 1% of these journeys are made by bicycle. A further 1% of journeys to work by people who live and work in the central area are also made by bike (DETR statistics 2000). No-one knows precisely how many journeys are made by bicycle in central London for all purposes each weekday, but a reasonable estimate would be in the order of 100,000. There are national and local targets to substantially increase the amount of cycling. Central London’s streets and passenger transport services struggle to cope with the demands placed upon them. Public transport use and traffic congestion have both increased over the past decade, as more people live and work in central and inner London and as tourist and visitor numbers continue to grow. Cycling is a low-cost, socially inclusive and environmentally friendly alternative to the use of public transport or the private car. Cycling provides benefits to the cyclist (including health and fitness, cost savings and speed advantages for short trips) as well as to central London itself (envieonmental benefits and reduced congestion). However, the high volumes of traffic and the lack of cycling infrastructure present significant barriers and disincentives to the expansion of cycling. To help overcome this situation, Central London Partnership set up The Business Cycle, a programme which aimed to encourage more people to cycle to work. – to develop improved cycling routes and infrastructure. In order to promote cycling to work it is necessary to understand more about the current pattern of cycling, barriers to cycling and incentives which could increase cycling. To this end, CLP carried out a study of ways people travelled to work at nearly fifty central London business locations. This was undertaken in association with Space Syntax Limited. – An on-line questionnaire used to survey all workers at participating organisations, with the aim of discovering their modes of transport and opinions on cycling to work. The survey was aimed at all employees in each organisation and 510 responses were received, with a relatively high response rate from active cyclists. – In addition the on-line questionnaire survey, a travel map survey of active cyclists was undertaken with cyclists indicating their current and ideal route to work. They were also asked to highlight the location of hotspots where they feel at risk from other traffic, such as dangerous junctions or lack of space. 423 maps were returned. 206 people (cyclists and non cyclists) indicated their perception of the main problems with cycling to work in London. The most frequently selected problems (from a prescribed list) were cycling is unsafe and urban air pollution, rated as the greatest problems by 29% and 20% of respondents respectively. Respondents were also asked to identify particular issues which are significant barriers to cycling. The results indicated that significant problems include issues of security and professional appearance, dress code and storage of belongings. – cyclists keep to main roads for the majority of their journeys but use side streets as they approach their destinations. – routes through parks are also well used – in particular Constitution Hill and Hyde Park. Figure 2 shows that the overall pattern of ideal routes is very similar to the pattern of actual routes. 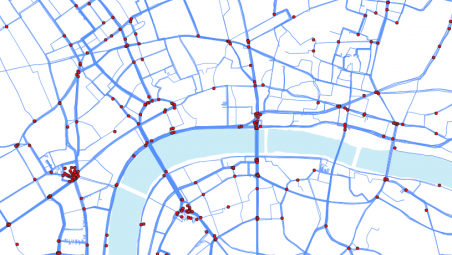 – street segments near to or across the bridges and at Vauxhall Junction were cited as actual more often than ideal routes – cyclists use these streets, but would prefer to have alternatives where possible. Respondents were also asked to highlight the location of hotspots, such as dangerous junctions or lack of space, where they feel at risk from other traffic and Figure 3 illustrates these. Highly hazardous locations are concentrated on the routes leading to each of the Thames bridges. In addition, major junctions, such as Trafalgar Square, Parliament Square, Elephant & Castle and Hyde Park Corner were consistently cited as such hotspots. There are also routes (such as Blackfriars Road/Blackfriars Bridge/Farringdon Road) where sequences of hotspots appear. A comparison of actual journeys and hotspots showed that cyclists do not avoid the hotspot locations. On the contrary, hotspots form part of highly used routes, and cyclists frequently include them in their ideal routes. This suggests that cyclists would prefer to see problematic locations improved (such as upgrading existing cycle lianes and improving safety for cyclists at junctions) – rather than alternative routes created. 1. Safety is the main concern for cyclists and lack of safety is the main deterrent to people who do not currently cycle in central London. 2. Of the various safety measures proposed, cyclists opted for more dedicated cycle-only routes. 3. Certain designated cycle routes are not well used by respondents. Few respondents include proposed London Cycle Network routes in their ideal route to work. 4. When asked to trace an ideal route to work, respondents proposed routes that correspond very closely to their current pattern of use, despite a high incidence of hotspots along these routes. 5. Commuter cyclists prefer to use major traffic routes for the main part of their journey and only choose secondary routes as they approach their destinations – this indicates a clear preference for simple, clear and direct routes to work. 6. Many main roads, vehicular junctions and the key bridges over the Thames are repeatedly cited as cyclist hotspots. The results of this study suggest that a change in policy towards the provision of new cycling facilities is likely to have a positive effect on the numbers of people choosing to cycle to work in London. – Resources should be directed towards improving cycling facilities on the most hazardous roads, junctions and bridges, especially in cases where cyclists have no practical alternative routes. – Wherever possible, new cycle routes should be designed on major road traffic routes in order to maximize cyclists’ access and convenience. – Employers should be encouraged to provide appropriate cycle storage and cyclist changing facilities at workplaces. – A new analytical approach to the provision of cycling facilities should be introduced to assist those concerned with improving London’s transport infrastructure. For a full description of methods and results, please refer to the full study report available from www.c-london.co.uk/businesscycle. The Business Cycle has been developed in partnership with London Cycling Campaign, local authorities, Government Office for London and Transport for London, Sustrans and the Health Development Agency. CLP would like to thank Government Office for London for support and participation in this survey. Thanks also to Transport for London for financial support for this publication. Published by Central London Partnership in association with Space Syntax Limited. Overlaid with the location of hotspots coloured up by frequency of citation. Warm coloured circles indicate frequently cited hotspots; blue, less frequently cited hotspots. Highlighting main routes in Central London.